A couple of months ago I was sipping a glass of elderflower cordial and thought to myself, "Wouldn't this be nice in a drizzle cake?" I felt ever so pleased with myself for this rather clever idea until I googled and discovered that there really is nothing new under the sun, and many, many people have created elderflower drizzle cakes before! Regardless of who had the idea first, elderflower cordial makes an amazing drizzle cake! Even non-elderflower fans liked it: Dave won't even consider drinking elderflower cordial, but he loved the cake and Lucas (who thinks that drinking flowers is weird) gave it trillion thumbs up. I loved the sweet floral burst with every bite, underpinned by the familiarity of tangy lemon. I saved up the idea for a PTA coffee morning at school yesterday, hence the lack of a pretty, styled shot. It was all a bit of a mad rush in the morning--as it always is frankly--and I felt a little weird about snapping photos of a cake in the school hall! This is a very simple recipe and I liked that the sugar was sprinkled on at the end, rather than being mixed in with the drizzle mixture. I always struggle to get the perfect crunchy and slightly glazed top when I do a drizzle cake, and this method gave me exactly the look I was going for! 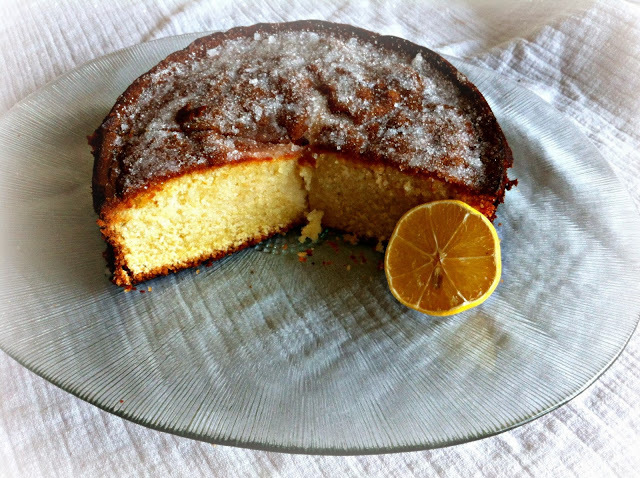 If you happen to have some elderflower cordial tucked away in the cupboard--whether homemade or shop bought--then you must make this cake! Preheat oven to 180C (fan oven 160C). Grease and base-line a 20cm (8") round, deep, loose-bottomed tin. Cream the butter, sugar and lemon zest together until pale and fluffy. Beat in the eggs one at a time, adding a teaspoon of flour with each to prevent curdling. Scrape down the sides of the bowl and then fold in the milk and the remaining flour. The cake batter should be pillowy. Spoon the batter into the cake tin and level the surface. Bake for 45-50 minutes until the cake is shrinking away from the edges of the tin and a skewer inserted in the middle comes away clean. Cool in the tin for 5 minutes. Squeeze the juice from the lemon, sieve it to remove the juicy bits and pips, then stir it into the elderflower cordial. Prick the cake all over using a fine skewer--make sure to get all the way to the bottom of the cake, so that the drizzle penetrates well. Spoon the drizzle over the cake slowly, letting it soak in before adding more. Finally, sprinkle the granulated sugar over the cake, it should sink into the surface slightly and when the cake finishes cooling it will form a lovely crunchy, sparkly topping. Leave the cake to cool completely in its tin before cutting into wedges and devouring. I've looked at this at precisely the wrong time of day - in desperate need of a huge slab of cake.